This article is about the British food and restaurant company. For the Irish tea company, see Lyons Tea (Ireland). J. Lyons & Co. was a British restaurant chain, food manufacturing, and hotel conglomerate founded in 1884. The company began as collaboration between the professional artist Joseph Lyons and his brothers in law, Isidore and Montague Gluckstein, as a spin off from the Salmon & Gluckstein tobacco company. In 1894 the company started a teashop in Piccadilly, London, and from 1909 developed this into a chain of teashops known as Lyons' Corner Houses. The company also ran high class restaurants, founding the Trocadero in 1895, and hotels including the Strand Palace, opened in 1909, the Regent Palace, opened in 1915, and the Cumberland Hotel, opened in 1933, all in London. From the 1930s Lyons began to develop a pioneering range of teas, biscuits and cakes that were sold in grocery stores across the world. Lyons was appointed to run the company, and it was named after him. J. Lyons & Co. was a pioneer in introducing computers to business. Between 1951 and 1963, the company manufactured and sold a range of LEO (Lyons Electronic Office) computers. The company was a substantial food manufacturer, with factories at Cadby Hall in Hammersmith, and from 1921 at Greenford, producing bread, cakes, pies, tea, coffee and ice cream. To the public, J. Lyons & Co. were best known for their chain of tea shops which opened from 1894 and finally closed in 1981, and for the Lyons Corner Houses in the West End of London. The tea shops were slightly more up market than their ABC (Aerated Bread Company) counterparts. They were notable for their interior design, from the 1920s Oliver P. Bernard being consultant artistic director. Until the 1940s they had a certain working-class chic, but by the 1950s and '60s they were quick stops for busy shoppers where one could drink a cup of tea and eat a snack or an inexpensive meal. The tea shops always had a bakery counter at the front, and their signs, art nouveau gold lettering on white, were a familiar landmark. 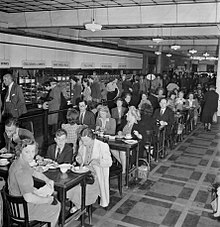 Before the Second World War service was to the table by uniformed waitresses, known as 'Nippies', after the War the tea shops converted to cafeteria service. Lyons' Corner Houses, which first appeared in 1909 and remained until 1977, were noted for their art deco style. Situated on or near the corners of Coventry Street, Strand and Tottenham Court Road, they and the Maison Lyonses at Marble Arch and in Shaftesbury Avenue were large buildings on four or five floors, the ground floor of which was a food hall with counters for delicatessen, sweets and chocolates, cakes, fruit, flowers and other products. In addition, they possessed hairdressing salons, telephone booths, theatre booking agencies and at one period a twice-a-day food delivery service. On the other floors were several restaurants, each with a different theme and all with their own musicians. For a time the Corner Houses were open 24 hours a day, and at their peak each branch employed around 400 staff. They featured window displays, and, in the post-war period, the Corner Houses were smarter and grander than the local tea shops. Between 1896 and 1965 Lyons owned the Trocadero, which was similar in size and style to the Corner Houses. As well as the tea shops and Corner Houses, Lyons ran other large restaurants such as the Angel Cafe Restaurant in Islington and the Throgmorton in Throgmorton Street. Its chains have included Steak Houses (1961–1988), Wimpy Bars (1953–1976), Baskin-Robbins (1974-) and Dunkin' Donuts (1989-). The artist Kay Lipton designed all the windows for the Corner Houses under the jurisdiction of Norman Joseph, the director post-war. The Regent Palace Hotel, Glasshouse Street, London was operated by Strand Hotels Limited, a subsidiary of J. Lyons and Company and opened on 16 May 1915. Strand Hotels also operated the Cumberland Hotel (Marble Arch, London), Kingsley Hotel, Park Court Hotel, Windsor Hotel, White's Hotel and the Strand Palace Hotel after the inception of Strand Hotels Limited. The last London hotel that they operated until the demise of the group in the mid-70s was the Tower Hotel situated by Tower Bridge in London. In 1938, Lyons purchased the Bee Bee Biscuit Company, which manufactured biscuits from its factories in Blackpool. Six years later, Lyons changed the company's name to Symbol Biscuits Ltd. and began selling biscuits under the Symbol and Lyons brand names: one of their innovations was Maryland Cookies in 1956. In 1990, Lyons changed the Symbol Biscuits name to Lyons Biscuits Ltd. The rearmament period just before World War II saw a big expansion in the number of Royal Ordnance Factories (ROFs), which were British government-owned. However, due to shortages of management resources some ROFs were run as agency factories; and J. Lyons and Co. ran at least one, ROF Elstow. The management and stock control systems needed in the ROFs, in respect of control of raw materials and "perishable" finished products, were somewhat similar to those used in the catering business; and J. Lyons was ideally suited to this task. They do not appear to have any involvement in managing these after 1945, when the ROFs started to run down. The top management of Lyons, with its background in the use of mechanical adding machines, saw the necessity of new electrical computers for organising the distribution of cakes and other highly perishable goods. They, therefore, substantially financed the University of Cambridge's Electronic Delay Storage Automatic Calculator (EDSAC) which was the second electronic digital stored-program computer to go into regular service, and built their own programmable digital computers and became the first user of these in businesses, with the LEO I digital computer: the Lyons Electronic Office I, designed and built by Dr John Pinkerton under the able leadership of John Simmons. It handled the company's accounts and logistics. Lyons also included the weather forecast to ensure goods carried by their "fresh produce" delivery vans were not wasted in large quantities. Google chairman Eric Schmidt called this "the world's first office computer", built in 1951. A subsidiary LEO Computers Ltd was formed in 1954 and went on to build 11 Leo II and 94 Leo III computers that were sold worldwide. The company was losing money in the 1960s but remained under the control of the Salmon family, descended from a founding partner. 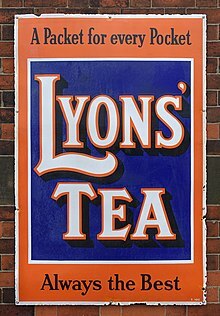 Lyons began to close some of its London tea shops and hotels; in 1963 it also merged its LEO Computers business with English Electric's computer interests to form the jointly owned English Electric LEO. In 1964, Lyons sold their half-stake; and English Electric merged the company with Marconi's computer interests to form English Electric LEO Marconi Computers. A continuing problem in the British computer industry was both lack of investment capital and competition with the much larger U.S. computer companies, such as IBM. English Electric LEO Marconi Computers merged with other companies to form International Computers Limited (ICL) which was bought by Fujitsu in 1990. In 1978, Lyons was acquired by Allied Breweries and became part of the resulting Allied Lyons. It fell on hard economic times in the late 1980s; and was sold, eventually being broken up with its ice cream and ice lolly products, which were branded as Lyons Maid, being sold to Nestlé. Other parts that were sold off included Lyons Cakes (sold to RHM and ending up as part of their Manor Bakeries subsidiary which also makes Mr Kipling's Cakes) and Ready Brek cereal (ending up being owned by Weetabix Limited). At the end of 1994, Lyons sold Lyons Biscuits to Hillsdown Holdings, which later sold it to a U.S. investment firm which subsequently sold it to large biscuit manufacturer Burton's Foods. The J. Lyons & Co. papers are now stored in the London Metropolitan Archives. The niece and nephew of the Gluckstein brothers were Hannah Gluckstein, a painter; and Louis Gluckstein, a Conservative politician. A descendant of the Salmon side of the original partnership is Nigella Lawson. Former British Prime Minister Margaret Thatcher worked as a chemist for the company prior to becoming a barrister and then a Conservative Party MP. While working for the company she helped develop methods for preserving ice cream. ^ "Leo Computers Society". www.leo-computers.org.uk. Retrieved 2018-05-27. ^ Brigid Keane, Olive Portnoy (1992). "English Tearoom". In Harlan Walker. Oxford Symposium on Food and Cookery 1991: Public Eating; Proceedings. Prospect Books. ISBN 978-0-907325-47-5. ^ "J. Lyons & Co catering outlets". Retrieved 28 March 2009. ^ a b Bird, Peter (2002). "Symbol Biscuits Ltd (Lyons Biscuits Ltd)". Retrieved 5 November 2007. ^ London School of Economics. "About L E O". Retrieved 30 March 2009. ^ "Google's Eric Schmidt criticises education in the UK". BBC News. 26 August 2011. ^ "Margaret Thatcher". Number 10 Downing Street - The official site of the British Prime Minister. ^ Baird, Peter (25 January 2012). "Site describing J. Lyons & Co national caterer and food manufacturer". Bird, Peter J. (1994). LEO: the First Business Computer. Wokingham: Hasler Publishing Limited. ISBN 0-9521651-0-4. Bird, Peter (2000). The First Food Empire. A History of J. Lyons & Co. Phillmore. Chichester, West Sussex. ISBN 1-86077-132-7. Wikimedia Commons has media related to J. Lyons and Co..
"Designing Britain 1945–1975: Lyons Corner House". "J. Lyons & Co.: an illustrated history by Peter Bird 1887–1998".